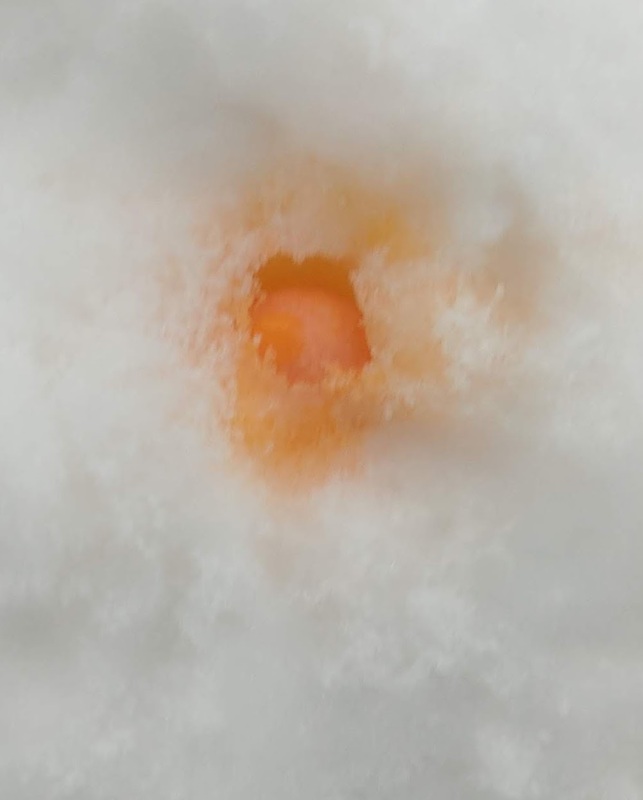 Drop a Warhead in baking soda water, and bubbles erupt. 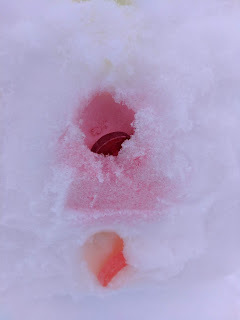 Leave a Skittle in water, and the S floats to the surface. Melt a Starburst, and shiny oil spots form. You're doing candy experiments--science experiments with candy. Melt Halloween candy. Dissolve Valentine hearts. Float Easter Peeps. 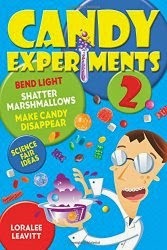 Or let your kids create their own candy science experiments. 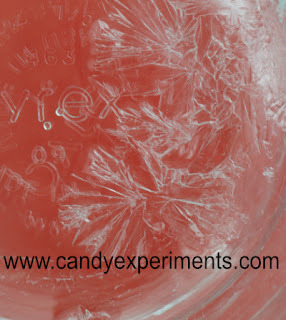 Candy experiments. All candy. All science. All fun. 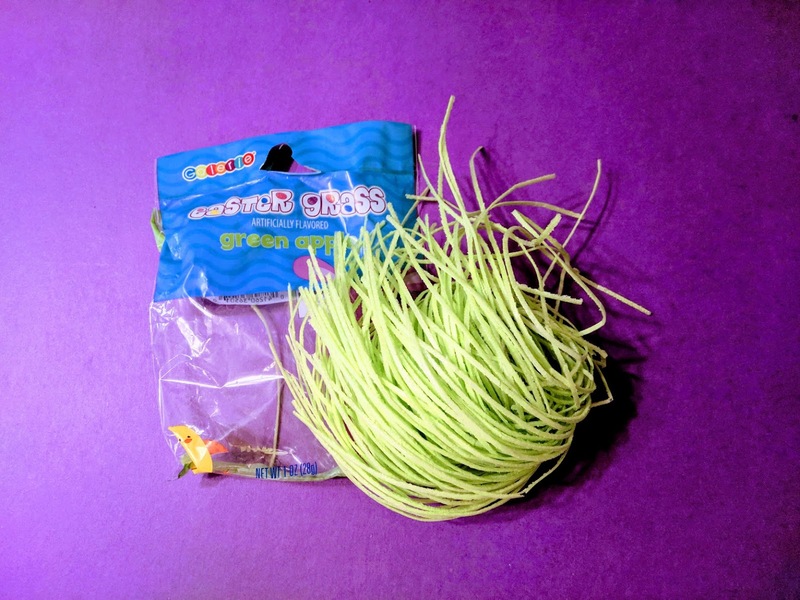 The Sea Turtle Conservancy reminds us that plastic Easter basket grass (left) lasts forever in the environment, often ending up in bird's nests and our waterways. BUt edible easter grass breaks down into starchy soupy water right away. No sea turtle danger here! Candy decorations in a snowman not only brighten it up--they create a candy laboratory! 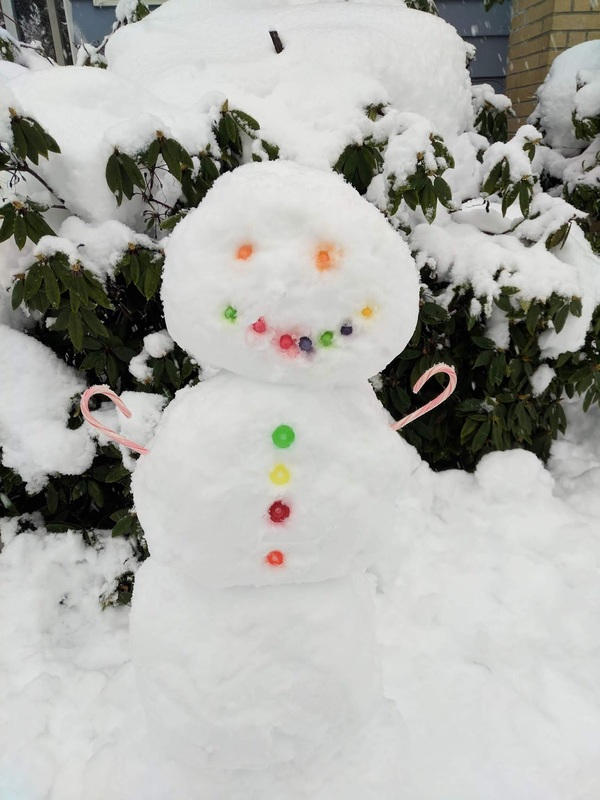 When candy touches the snow, the sugar starts to dissolve and mix with the melting snow. Since sugar water has a lower freezing point than pure water, it stays liquid, spreading colored streaks through the snow and melting whatever it touches. The sugar water even melts the snow beneath the candy, causing it to tunnel downward. The colored candy solution also spreads outward. 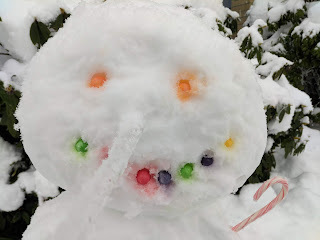 Just as water soaks up paper towels, the candy water spreads up the spaces between the close-connected snow crystals, giving this snowman an orange halo around the eyes. Capillary action at work! 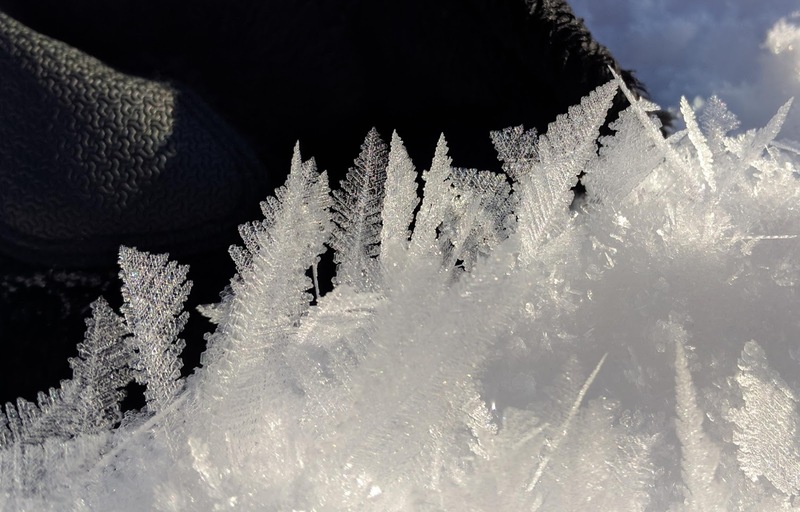 When our snow melted slightly in the sunlight, then refroze overnight, it made beautiful ice feathers. Apparently these hoarfrost* ice crystals are made from single tiny columns of ice, but since some of them grow at angles to the others, they create a feathered shape. Mix 1 tbps water with 3 tbsp xylitol, heating and stirring until the xylitol dissolves completely. Pour half the solution into a second bowl and put both bowls aside for several hours. The thin film of xylitol should crystallize into feathery patterns. Place candy on a flat plate or dish. Use a bulb syringe to draw the outline of the puddle you want to create. Once the design is complete, gently add water to the middle of the design and watch the colors spread. 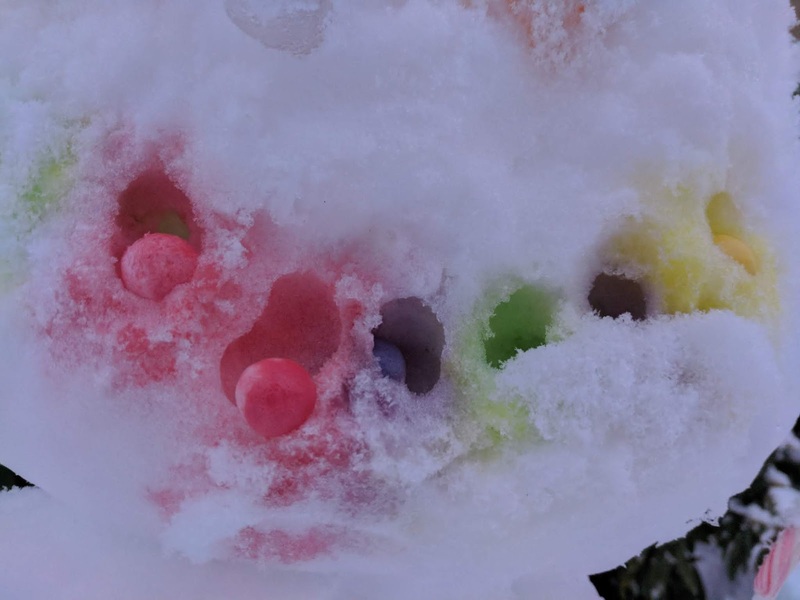 Colored candy such as M&M's and Runts are covered with shells of colored sugar. When you put them in water, the colored sugar starts to dissolve, creating a dense sugar solution. This solution sinks and starts to spread into a colored puddle. If two puddles of similar density collide, neither puddle can push the other out of the way. Instead, they stack up against each other as they expand outwards, forming distinct bars of color. Don't let soda companies buy their way out of a Seattle tax! Mini M&Ms on a flat surface form a flag as they dissolve. To repeat at home: arrange mini M&Ms on a small flat rectangular surface with raised edges. (This one is a lid from a plastic resealable container.) Using an eyedropper, gently drip water into the middle of the rectangle and let it spread out. Make sure that you are not squirting the water in one direction or another--if the water is flowing in any direction, it will push the dissolving color that direction. Above all, do not stir! Because the candies are regularly spaced, the dissolving solutions push against each other as they spread, creating the stripes.